Amarfis is the vocalist for the band "Amarfis y la Banda de Attake". Amarfis was born in Sabana Grande de Boya, a town in the Dominican Republic. His preference for music was demonstrated from an early age as family members describe his childish creations of music with pots and pans as a toddler. One family member in particular, uncle Viro Mejia, also a musician who focused on the guitar, helped Amarfis set a course towards music. Aquino left his native island and moved to New York where he studied music, namely composition and arrangement, at City College. His work on many tropical music groups eventually led to his discovery by label Sonolux, a subsidiary of Sony Music. After being discovered, Amarfis set up his own band, dubbed Amarfis & la Banda de Attake. Together they generated such hits as "Los Grilleros" among others, which later showed up in many Latin American countries as well as the U.S. and Europe. 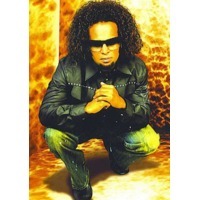 Eventually his name and music became household names and in 2005 he appeared on Billboard's Latin Tropical Airplay. He later on was able to collaborate with renowned Latin-genre artists such as Los Tigres del Norte, Limite, and Juanes.